Fair. 0785139168 Please allow 4-14 business days for Standard shipping, within the US. Thank you for supporting our small, family-owned business! Petrus, Hugo. Very Good. 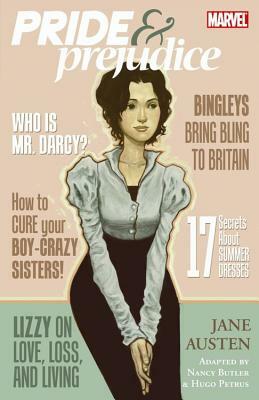 Pride & Prejudice GN-TPB (Marvel Classics) by Butler, Nancy, 2010-06-09. Trade paperback (US). Glued binding. 120 p. Contains: Illustrations, color. Marvel Classics (Paperback). Intended for a young adult/teenage audience. Very Good. Ships M-F. Very good book with light shelf-wear. This is a great reading copy. We protect your purchase with damage-resistant double-layer bubble-wrap packaging where possible. Your purchase helps fund small charities in Ohio, Kentucky, Indiana. *Our delivery standard: order received by 2PM Eastern US time goes out by 4: 30 PM M-F.